The membranes used for reverse osmosis systems have a dense polymer barrier layer in which separation takes place. Since Reverse Osmosis does not occur naturally, it must be created by applying pressure to the high solids water in order to force it through the membrane, with pressures from 8 - 14 bar for fresh and brackish water, and 40 - 70 bar for seawater, which has around 24 bar (350 psi) natural osmotic pressure which must be overcome. Fluid Systems RO Plants work on the Crossflow Filtration method, which takes the feed water and uses a percentage of it as a wash or reject stream, removing the solids during the filtration process. 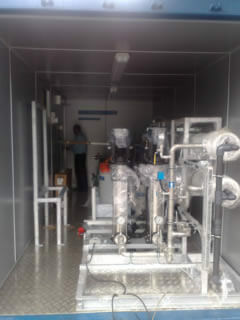 The product flow of an RO Plant is mainly a function of temperature and pressure. System recovery (product divided by feed) is limited by the characteristics of the feed water and can be controlled through the use of recycle stream. Product quality is based on a percentage of dissolved solids fed to the membrane. There should be an economic balance between product quality and system recovery. High recoveries increase concentration of dissolved solids in the system which degrades quality, but high recoveries make the system work more efficiently and decrease waste. Reverse Osmosis Plants do not deliver to service all of the water that is fed to them. During operation, some of the incoming water is used to wash down the membrane, and only part becomes finished product water. Purified water is referred to as product and wastewater is referred to as concentrate, or reject. The percent of water delivered as product is called the recovery, and depends upon the membrane and on total RO Plant design considerations. The feed water, depending on its source, may contain various concentrations of suspended solids and dissolved matter. Suspended solids may consist of inorganic particles, colloidal particles and biological impurities such as microorganisms and algae. Dissolved matter may consist of highly soluble salts, such as chlorides, and sparingly soluble salts, such as carbonates, sulfates, and silica. One of our most popular series, the Commercial RO usually comes in standard Models. These Commercial RO Systems can be customized to add Multimedia Filters & Activated carbon Filters, Water softeners, Antiscalant Dosing Systems, and UV sterilizers. We manufacture a wide Range of industrial Reverse Osmosis Plants to cater the stringent process requirements. Our industrial reverse osmosis Plants are carefully customized and configured to suit the individual requirement of the output water, which varies from normal drinking application to the specific usage, such as food Processing, pharmaceuticals and boiler feeding requirement. These systems come standard with pre-filters, chemical dosing and Antiscalant dosing. 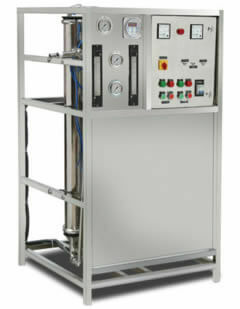 Customization is available on all our units based on individual water application and customer needs.